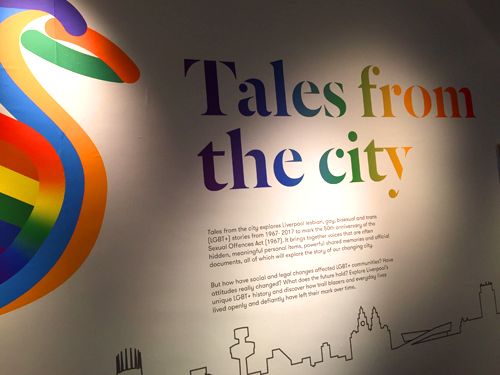 Last week, the Tales from the city exhibition opened at the Museum of Liverpool. I first became aware of this exhibition about 18 months ago through working on other installations at this wonderful location. The curation team there were keen to gather stories, artefacts and the personal possessions of LGBT folk from across the city to tell stories rarely told. Because I’ve been around exactly the same amount of time as the partial decriminalisation of homosexuality and the Sexual Offences Act of 1967 (what a lovely claim to fame to have) – I knew I’d be able to help with contacts and content. Early on I handed over a lot of things from my archive – including tickets and programmes from dozens of theatre productions from the last 30 years, photographs, leaflets, artwork and sketchbooks for early health education campaigns. One of the first things I worked on after getting my first job as a graphic designer with access to Letraset and a decent photocopier, was the promotional material for Project 28. This grassroots local event in 1988 was an artistic and cultural protest against the Conservative Government’s reviled Section 28 legislation. People were angry and doing nothing wasn’t an option, so in Liverpool, a passionate band of us voluntarily came together, mainly from the arts to set up a day of action with theatre, music, comedy and a march through the city. The event was significant for me as it marked my political awakening and also my 15 minutes of fame as a pop star/synth player! Eat your heart out Vince Clarke and Chris Lowe. Project 28 was perhaps understandably overshadowed in local history by Manchester’s much larger, Council supported Never Going Underground event that happened the same year, which itself was the subject of an exhibition last year in Manchester. My very basic design work for Project 28 is on display in one of the cases at Museum of Liverpool along with plenty of other bits and pieces that I’d largely forgotten about. I was also interviewed for the exhibition and my story is one of many that can be heard throughout the gallery. I attended the very well attended launch and felt a different kind of pride as I was reminded of just how much creativity, energy and passion there is in Liverpool. It’s always been there and the city has always punched above its weight, but what the Museum of Liverpool has pulled together really is remarkable and after a couple of visits now, I’m still discovering new things. This powerful exhibition marks the 50th anniversary of the 1967 Sexual Offences Act with stories from Liverpool’s lesbian, gay, bisexual and trans (LGBT+) community over the past five decades. The exhibition reflects how the lives and experiences of Liverpool’s LGBT+ community have changed from 1967 to 2017. Individual stories are told through a mixture of objects, costume, art, photography, film and oral history interviews. The exhibition also explores the impact of national events such as Section 28, civil partnerships, marriage, age of consent equality, and equal adoption rights. Do yourself a favour and get along to the show, and hang around long enough in the costume area and you’ll even hear a pop song that I recorded in my bedroom nearly 30 years ago! You’ve been warned.